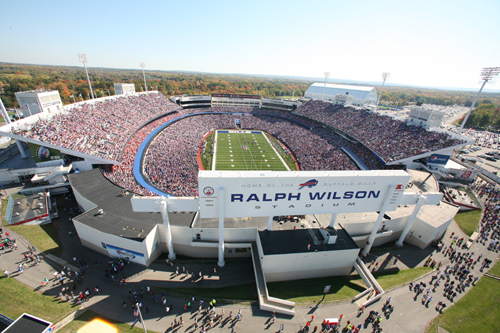 The big news this Football Friday is that the Buffalo Bills game in Orchard Park this Sunday versus the Cincinnati Bengals… will be on TV! Thanks to a last minute gift from Ralph Wilson, Jr. the nonagenarian owner of the Bills, local fans will be able to watch the game from their homes. But, after losing to THE BROWNS last week on national TV—by thirteen points!! !—and losing their starting QB, why on God’s green earth would anyone want to see this game, anyway? Last week, we Bills fans had to endure the sight of our first-round, wonder kid, phenom rookie QB writhing on the sideline, clutching his knee. (As well as a Browns defender standing over him, pumping his fist in victory… despite the fact that EJ Manuel had just converted a third down with his run, setting up the Bills’ go-ahead touchdown mid-to-late third quarter… hmm…) Hearts sank, stomach knots twisted, throats felt nervous lumps rise… and basically all hope was lost. Throw the season in the toilet, flush, and prep for next year’s draft, fellas! After watching then-backup quarterback, Jeff Tuel (another rookie QB) look quite pedestrian (and that’s being kind) most Bills fans could agree that there wasn’t much to be cheery about as a Bills fan. Even with lots of injuries still, including losing Stevie Johnson somewhere in the second quarter, the Bills had managed to endure crazy-huge punt returns—one for a long TD—by the Browns, which gave them a 17-10 half-time lead, and take a third-quarter lead of their own, 24-17. The Bills defense (still depleted by injuries) held the Browns’ running game in check, and really their offense, despite bad field position thanks to those punt returns. Even the NFL Network announcers were pretty much handing the game to the Bills by the third quarter, with Mike Mayock commenting repeatedly that the Bills were just, “tightening the noose” with each successive first down. Credit the Browns with taking advantage of Aaron Williams at cornerback—and a great catch by Josh Gordon on the game-tying score, bobbling, and then pulling it in while managing to get both feet down in the end zone. 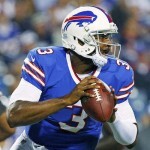 EJ going down (for two to eight weeks, say his doctors) the Bills had to find more QB help. There was talk of recently-released Josh Freeman, but he chose Minnesota. There was more talk of Pat White (really??) and a few other cast-offs. But the Bills chose to bring Thaddeus Lewis off the practice squad and place him at the front of the bus, starting the game this week against Cincinnati! With the large list of injured (important) players, now larger and bearing the name E. J. Manuel, on top of the more important 2-3 overall record that they now hold, and a practice squad QB as our starter (and Jeff Tuel as his backup!) … it sure did seem as though all hope was lost. So really, other than players on injured reserve, the only player who is definitely out this weekend is EJ Manuel. The rest of that large list that the Bills have sported each week so far in 2013 … might be completely eliminated! Everyone playing! 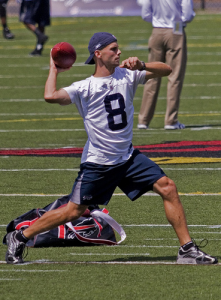 With all the trouble at QB, maybe Brian Moorman will step in if there’s an injury. He’s always exciting, that’s for sure. And usually pretty fired up! Should get a big, friendly welcome from the crowd at The Ralph this Sunday when he comes out on the field. The Bills might do well to introduce the special teams starters before the game, just to pump up the crowd a bit more! I’m kinda worried about making this prediction. I’m 0-3 so far. I predicted a loss, and they won. I predicted two wins, and they lost. Yikes! Well… as I see it… the Bengals offense is not very good. They only got SIX points against the Cleveland Browns! We posted 24, and likely would have scored more. They do have AJ Green (a GREAT wide receiver) but we are getting all of our corners back (hopefully) and we apparently have a pretty decent D-coordinator in Mike Pettine! The Bengals defense is a different story. They are good. But the Bills will have home field advantage, which should actually help a bit, and so far this year, the Bills have done well, even against pretty decent defenses (maybe especially Baltimore, but really every team they have played has a better-than-average defense! The Jets, Panthers, and Browns are #2, #3, and #4 after five weeks! Oh my!) The Bengals currently rank eighth overall, and tenth overall against the run—probably the Bills offensive strength. I know I’m probably guaranteeing a loss with that prediction, but… well, that’s what I think will happen! Plenty of takeaways (Kiko Alonso! Jairus Byrd? ), good defense, and an offense that moves the ball well enough to win. So … go Bills! Enjoy your football weekend! UPDATE: Right after this published, the Bills announced that Ron Brooks will not play this weekend. (He is listed as “Out”, along with EJ Manuel.) Stevie Johnson and Stephon Gilmore are “Questionable” and being called “game-time decisions”. ← [Football Friday] Wait… What Day Is It?